Congratulations to Anna Newbold, Christian Dickenson, Ivan Mitov, Jonathan Eve, Stefani Dritsa and Steven Bailey from Aberystwyth University’s club competed, as well as Christopher Davies and Rostislav Revako from the main dojo based at Penweddig School. All competitors performed well on the day, with our team kata, consisting of Anna Newbold, Christian Dickenson and Stefani Dritsa, taking 5th place overall, and narrowly missing out on a place in the final. Rostislav Revako took bronze in the Men’s Black Belt fighting (kumite) event. Two of our members went head-to-head in the Men’s 7th-1st Kyu Kata event, with Christian Dickenson walking away with a bronze medal, and Christopher Davies taking home the silver. Finally Steven Bailey performed exceptionally well in the Men’s Black Belt Kata event, winning the silver. 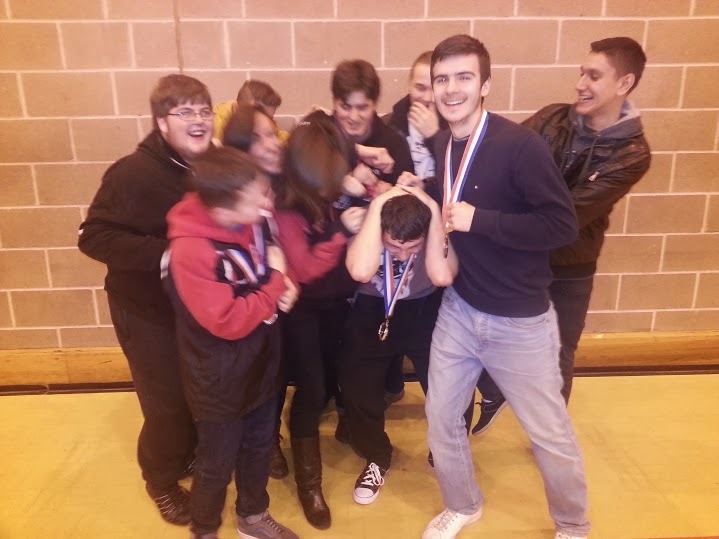 This entry was posted in Tournament and tagged 2013, Anna Newbold, Christian Dickenson, Christopher Davies, Ivan Mitov, Jonathan Eve, Oliver Delf-Rowlandson, Ros (Rostislav Revako), Stefani Dritsa, Steven Bailey, Student Champs by admin. Bookmark the permalink.